Nat Young riding a Keyo surfboard at Dee Why. 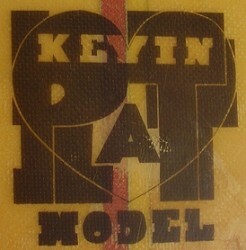 Vol 1 Number 1 August 1962, page 7.
similar to the original Hobie Surfboards decal. A major manufacturer, the company maintained a high standard and a quality stable of shapers 1961- 1974. 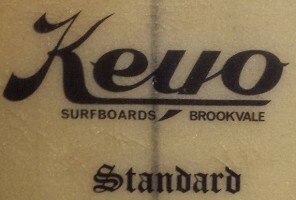 Originally started by Dennis (Denny) Keogh, the label was at the cutting edge in surfboard design 1965 to 1970. The securing of the Hobie Cat franchise in 1969 quickly saw the company divert its resources to this expanding market at a time when the surfboard industry was experiencing one of its many unheavals. Like many Australian decals the company logo is a copy of an American design, in this case Hobie Surfboards. 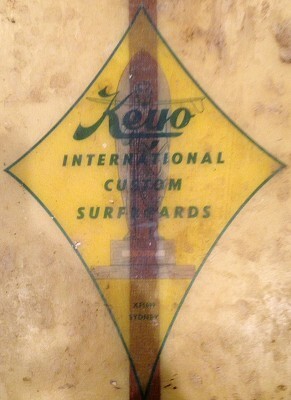 The design was later used by Geoff McCoy when he left Keyo Surfboards and started his own company. 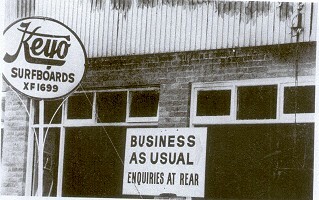 One of the Brookvale Five - manufacturers with national sales and reputation in the ten years 1962 to 1972. 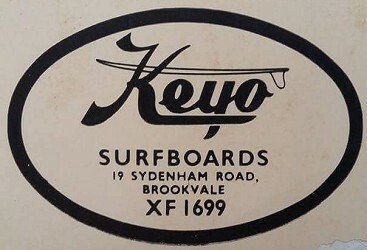 In 1957 a young Denny Keogh started shaping surfboards from a garage, and officially opened the Keyo Surfboard factory and retail shop in the Northern Beaches suburb of Brookvale in 1959. A neighbourhood that quickly became the countries surfboard manufacturing hub. 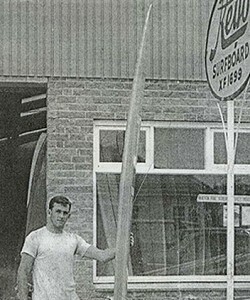 Midget Farrelley, winner of the 1962 Makahah international, was the first surfboard shaper brought in to help with the workload. 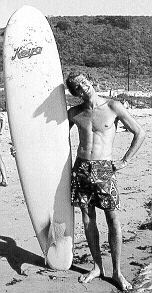 Denny in fact shaped the board that Midget rode to victory in the first World Surfing Championships, held at Manly Beach in 1964. 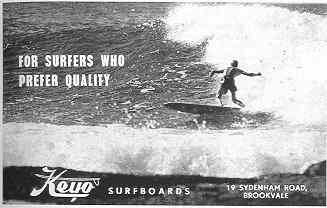 Bob McTavish joined Keyo in 1967 where he shaped the first Vee-bottom a wide backed nine footer that kicked off the short board revolution. The McTavish designed Keyo Plastic Machine Vee bottom models were soon selling at the astonishing rate of 70 a week. In 1968 Nat Young came on board and with his high profile they produced another popular model, the Nat Young Tracker. Some classic Keyo models are the Keyo International, Tailor Made, Plastic Machine, Kevin Platt Model, Egg, Side Slipper and The Virgin. - keyointernational.com, viewed 11 January 2014. Denny Keogh; fibreglassed foam blanks, some balsa? Right: Denny Keogh outside Sydnenham Road, Brookvale, factory, circa 1960. Image courtesy of Keyo International. 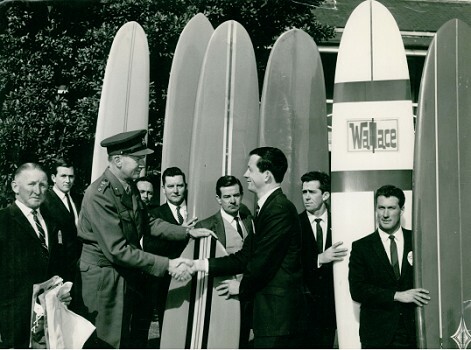 With increasing demand, 1962 Makaha winner (, Midget Farrelly, was one of Keyo's earliest shapers. "Started at Norm Casey Surfboards, Rockdale. 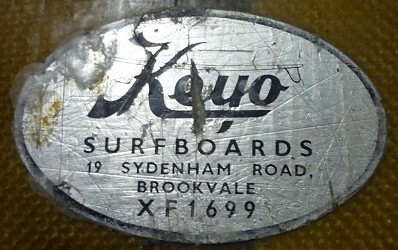 Then to Keyo Surfboards, Brookvale, circa 1962, where learnt shaping from Midget Farrelly. Shapes included Midget's post Makaha Contest win International Custom model. With financial backing by Peter Clarke, opened Wollongong shop, opposite to Byrne Surfboards current shop at Fairy Meadow. Small number of boards produced here, later to Kenn Surfboards, Queensland." - personal interview, 13 December 2003, thanks to Gary Birdsall. The International Custom decal featured the Makaha International Trophy, a clear reference to Midget's Makaha win. 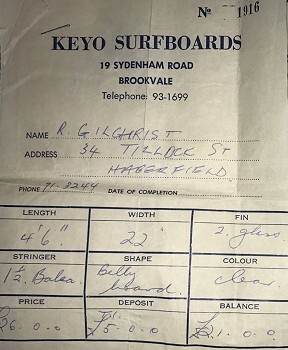 Keyo dealers in 1963 included Tony Olsson in Melbourne, who would manufacture boards there in the late 1960s, and Alby Falzon at The Entrance,. Falzon would later produce The Morning of the Earth (1972). Midget Farrelly wins the first World Surfing Championships, held at Manly Beach, on a Keyo shaped by Denny. 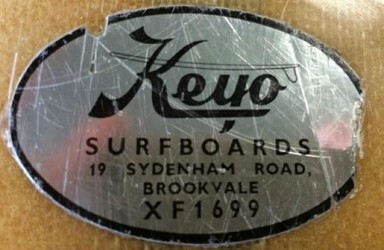 Around this time, Keyo also manufactures and markets the Midget Farrelly Competition Design Surf Skate(board). 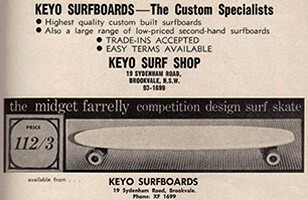 Right: Keyo Surfboards and Midget Farrelly Surf Skate advertisement, circa 1964. 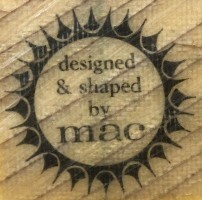 Tailor Made by Bob McTavish boxed decal, noted. Surfabout, Volume 3 Number 2 page 7, 1966. Volume 1 Number 1, December 1967, page 4. December Bob McTavish surfs his Keyo stringer-less vee-bottom at Sunset Beach (Duke contest) and later at Honolua Bay, Maui. Extensive coverage in magazines and film. See The Hot Generation Part 6, and The Fantastic Plastic Machine. Other Keyos are Nat Youngs' Deep Vee and Ted Spencer's Little Red. Manufactures/distributes? SafeSet Fin boxes, a copy of the WaveSet design. In early the summer of 1967-1968 the Keyo factory burnt down, but was quickly re-opened in premises behind the guttered factory. Keyo Surfboards - Business as Usual. March 1968, Vol. 10. No. 3 , page 36. In the next issue Surfing World (Vol. 10. No. 4 April 1968, page ?) 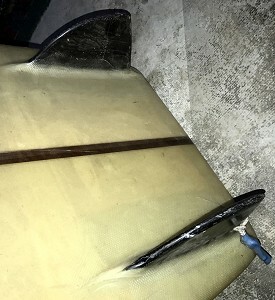 reported the Keyo fire and also noted, "coincidentally within a few hours of each other, though more than 600 miles apart", the gutting of the Klemm-Bell Surfboards factory in a suburb of Melbourne. 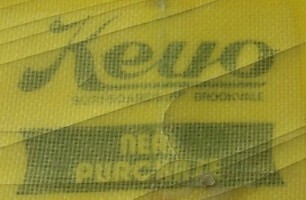 construction detail that puts KEYO apart. ... WE CREATE THEM ! 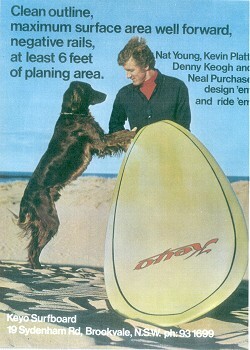 Advertisement: Keyo Surfboards, Nat Young, Youngblood, and Tracker, 1968. Jess Keogh emailed August 2006"
Just A quick note to inform you of an error in your website. 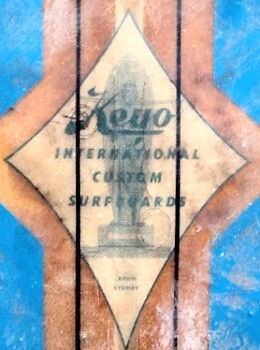 Keyo surfboards was established by Dennis (Denny) Keogh not Danny Keogh. Thanks to Jess Keogh for the spell-check, and the compliment. 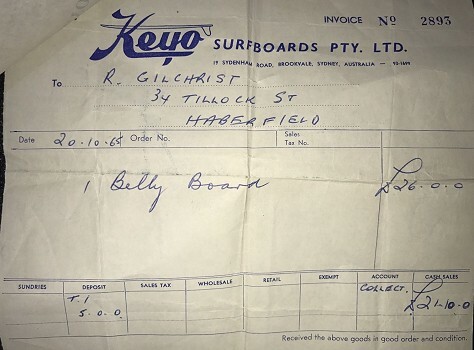 Bob McTavish/Keyo Surfboards Plastic Machine. Cut back, Long Reef Sydney circa 1967. 1. Original logo includes the silhouetted surfboard, as in the original Hobie Surfboards Design. 2. The photograph, unaccredited, features a young Nat Young at Dee Why Point. He probably was not sponsored by Keyo Surfboards at the time. 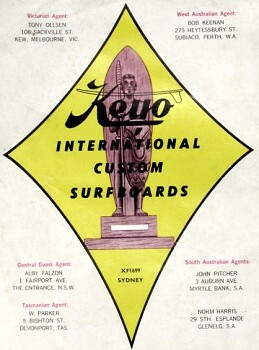 Keyo International Custom Surfboards, 1963-1964.
with Makaha International Trophy image. 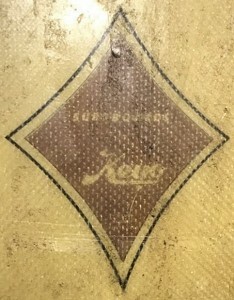 Keyo Yellow script Hobie Surfboards script and diamond with silhouetted surfboard, circa 1960. Yellow script with black text and box. this board shaped by Geoff McCoy, 1969. Plastic Machine Red Circle, 1967. 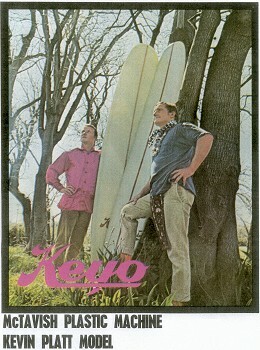 Kevin Platt Model, Keyo Surfboards, 1967. Pod Markings: .1066. N (Neil Purhase? ), 1967. Geoff Cater (1999-2019) : Catalogue : Manufacturer Index - Keyo.